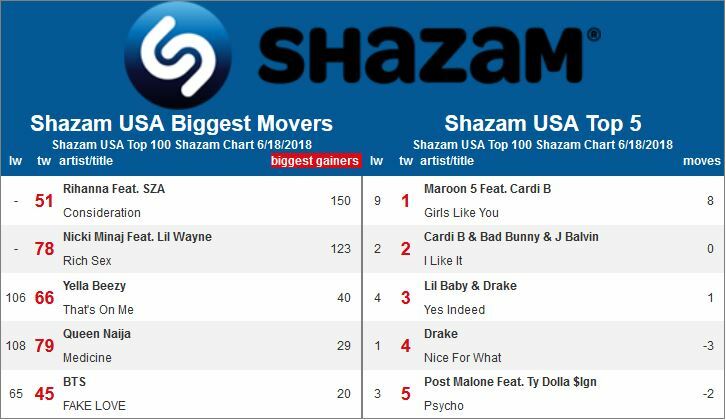 The greatest gainers on Shazam’s USA Top 100 land there for three reasons this week: Radio airplay; Hulu’s The Handmaid’s Tale; and a first, walkup music for a boxer. Welterweight champion Errol Spence Jr. strode to the ring over the weekend with Yella Beezy performing “That’s on Me” (PMG) alongside him, pushing up the April release 40 slots to #66. The song was longer than the fight: Spence knocked out his opponent in the first round. “That’s on me” trails Rihanna’s 2016 collaboration with SZA on Anti, “Consideration” (WestburyRoad/Roc Nation), which rises to #51 after being featured on the end credits of The Handmaid’s Tale. Recent singles from Nicki Minaj, Queen Naija and BTS flesh out the Top 5. The songs attracting thumbs in the U.K., meanwhile, are completely different. The Top 12 on the greatest gainers list are all new to the Top 200, led by Anica Stemper’s cover of the Ben E. King hit “Stand By Me” that we can only find on SoundCloud and a Shazam compilation. The only song released by Scronicki, a cover of Baby D’s “Let Me Be Your Fantasy” that appears on the compilation Lounge Acoustic Covers and was used on ITV2’s Love Island, follows.